Directions: Preheat grill to high heat. Over a large bowl, drizzle each romaine quarter with a few tablespoons Spicy Caesar Dressing, massaging to evenly distribute dressing between the leaves. Grill the hearts, turning every minute or two until lightly browned on all sides. Meanwhile, season avocado slices with sea salt and freshly ground black pepper and place on the hottest part of the grill. When char marks appear flip then remove when grilled on both sides. 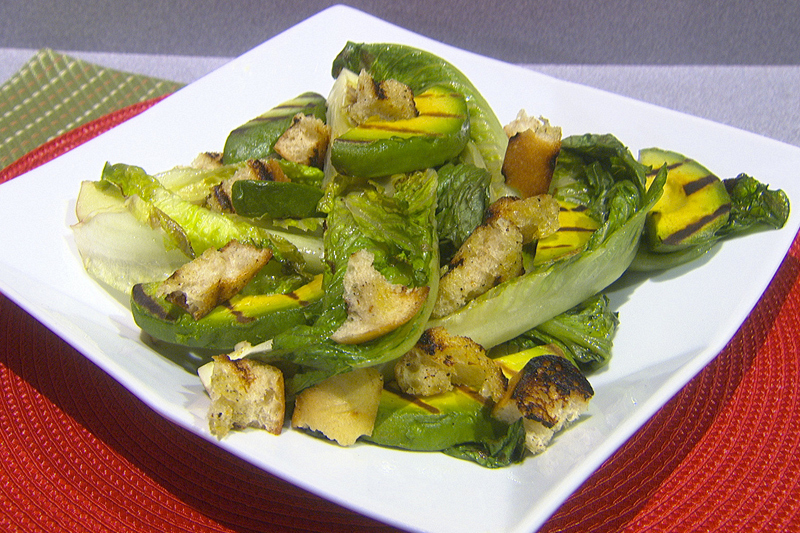 To serve, toss grilled hearts in a bowl with the grilled avocado and Torn Grilled Bread Croutons adding any extra dressing needed to season the salad to your liking. Serve immediately.